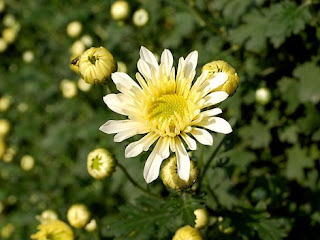 Chrysanthemum is a famous flower found everywhere in China. It is rich in varieties with light and pleasant fragrance and extraordinary functions. Since it is a common flower as well as a medicinal food, the Chinese has kept the practice of watching and tasting chrysanthemum ever since thousands of years ago. Among all breeds, the white chrysanthemum can be made into a drink called chrysanthemum tisanes, while sometimes tea leaves are added so as to blend the flavor. The effect of chrysanthemum tisanes is also elaborated in the book Compendium of Materia Medica: it's slightly cold in nature with sweet flavor and the effects of dispelling wind heat, suppressing hyperactive liver and improving eyesight. The modern medicine science have also proved upon research that chrysanthemum can help to lower blood pressure, remove cancer cells, expand the coronary artery and prevent bacterial contamination. Long-time drinking of the tisanes can help increase calcium in human body, regulate myocardial function and reduce cholesterol, which is especially good for people at middle or senior ages or for preventing the epidemic conjunctivitis. It's also good for eye dryness caused by irascibility or excessive use of eye. 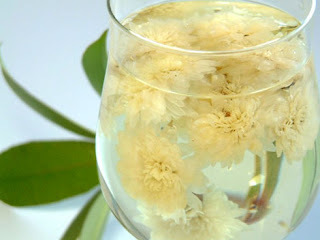 Meanwhile, the chrysanthemum tisanes is rich in aroma and refreshing, which also helps to relax and relieve headache.